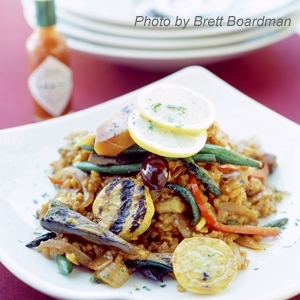 Note: Calaspara rice is from Valencia in Spain and is typically used for making paella. You can substitute jasmine rice or other short-grain rice if it is unavailable. Preheat the grill (broiler) to high. Cut the capsicum into large pieaces, removing the membrane and seeds. Place the capsicum, skin side up, under the grill until the skin blackens and blisters. Cool in a plastic bag, then peel and roughly chop. Place the capsicum, garlic, olive oil and paprika in a food processor and blend until smooth. Season with sea salt and cracked black pepper to taste. Lisbon paste can be stored in an airtight container in the refrigerator for up to 3 days. 3 tablespoons freshly squeezed lemon juice. Combine all the ingredients in a small saucepan over low heat and gently heat until the butter has just melted. Remove from the heat and use as needed. Dissolve the saffron threads into 2 litres hot water and stand for 20 minutes for the saffron to infuse. Preheat the grill (broiler) to high. Cut the capsicum in half and remove the membrane and seeds. Place the capsicum, skin side up, under the grill until the skin blackens and blisters. Cool in a plastic bag, then peel the skin. Discard the seeds and membrane and slice lengthways into 5mm strips. Set aside. Heat the olive oil in a saucepan over medium-high hear and add the onion, garlic, bay leaves and paprika and cook for 5 minutes, or until the onion has softened. Add the rice and stir to coat in the oil. Stir in the Lisbon paste and cook for a further 3 minutes, then add the wine and stir for a few minutes, or until absorbed in the rice. Add the saffron stock to the pan and bring to the boil. Reduce the heat, cover with a tight fitting lid and cook for 20 minutes, or until the rice is just tender. Remove from the heat and spread rice out on a large tray to cool (this will stop the cooking process). Cover to keep warm and set aside until needed. Meanwhile, prepare the vegetables. Coat all the vegetables with the marinade. Place on a barbeque chargrill plate or a ridged chargrill pan and cook over medium high heat for 5 minutes, or until cooked through. Arrange the vegetables over the rice. Garnish with the lemon slices, chopped parsley and kalamata olives, to serve.